auto i = 0; // ?? 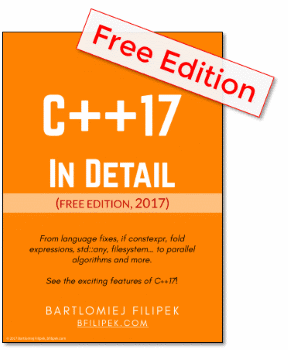 C++11 brings us a very useful set of tools. It adds fresh air to the hard life of a programmer. The updated syntax makes the language a more modern and easier to use. In this post let's take a quick look at a nice keyword 'auto' that, at first sight might seem very simple. Though, it appears that there are still some 'features' behind it and worth to consider. For instance, what about references and pointers? A variable declared with auto is deduced at compile time and, that way, it saves a lot of typing from our side. It will be often used with complex template expressions and STL types. Cool feature and looks easy to use...right? But what about more complicated types... what about pointers and references and their constness? varAuto will have double (not reference to double) type!. This time though varAuto is a pointer to double. Why is there a difference then? As we see it will work for the normal types and pointers, but for references and const references we need to explicitly write &U or const &U. Otherwise reference or constness will be lost. Item 1 "Understand template type deduction"
Item 2 "Understand auto type deduction"
auto f = myFloat; // f is 'float', const is dropped! fc = 2.0f;               // error! *pb  = 100;          // error! *ppb = 101;          // error! // declaring a pointer. It will be more visible. auto type deduction simplifies writing code. Basically it deduces a variable type at compile time. It's important to remember that the whole deduction process works in the same way (with some little exceptions) as template type deduction. Before C++11 auto keyword was used to declare a variable with a local lifetime. Now such declaration generates error (see this msdn link). How about Gcc?